The totally quintessential fall candle, it smells like a pumpkin, and will fill your whole room with the scent of fall. It’s not a sweet smell which I really appreciate too. Bonus, it’s currently on sale through Macy’s, so make sure to click the link above to save some $$$. This was a gift from my amazing Mom when I went home to NJ this past weekend. Um, is this not just the coziest sweater coat ever?! The colors give all the fall vibes, and it is so soft and comfortable. I know the price is on the steep side, but it’s super high quality, and I know I’ll be wearing it a ton this season, and many cold seasons to come! Okay so, this is a favorite because I rediscovered it in my beauty stash before a wedding last weekend and oh em gee, I forgot how much I love this primer! I love how smooth this makes my skin before I start going ham with makeup- I truly feel primed and ready to go after applying it. It’s an oldie but goodie for sure- with some many primers on the market we can get caught up, but I was reminded last weekend the tried and true products are always the best. I had a bit of a LOFT haul moment during their 50% off the entire website sale, and this tee is so soft and comfy it’s going to be perfect to dress up or down. As a teacher having simple but cute tees like this are a life saver. LOFT is always my work and casual go to, and if you catch LOFT on a good day, you’ll pay way less than $25. I actually got this shirt for $12 last week during their weekend sale, so just lookout, I’m sure they’ll have another great sale coming up! My favorite candle in shower gel form! 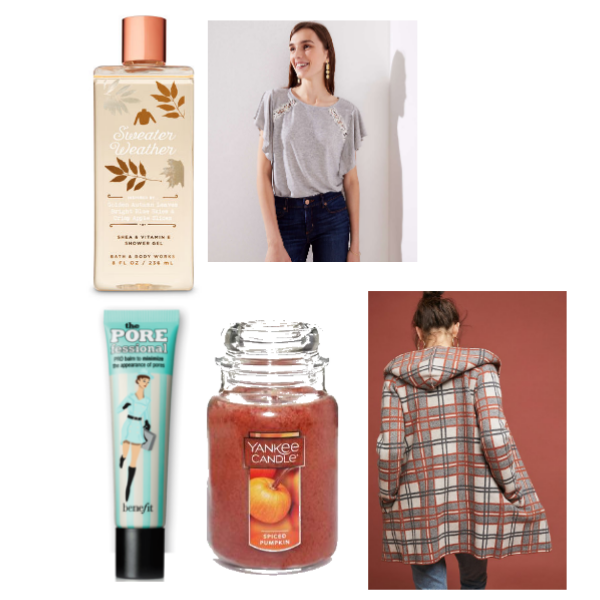 Sweater Weather is the ultimate fall scent, and using it as a shower gel/ bath bubble makes it that much better. Notes of apple and fall leaves are so amazing after a long day of teaching. I know this is sold out online, but I’m sure they have more in store. Right now there’s a buy three get three free or buy two get one free promo. Previous Previous post: REMINDER | Virginic Skincare GIVEAWAY!